[Episcopal Church in Minnesota] The Rt. Rev. Brian N. Prior and the trustees of the Episcopal Church in Minnesota (ECMN) have known for a while that the offices located on Loring Park in Minneapolis were not a fit for ministry. Only one room could accommodate more than 10 people and the building lacked accessibility and an elevator, meaning meetings often needed to be scheduled elsewhere. Over time, the list of ways that the space did not work grew longer. 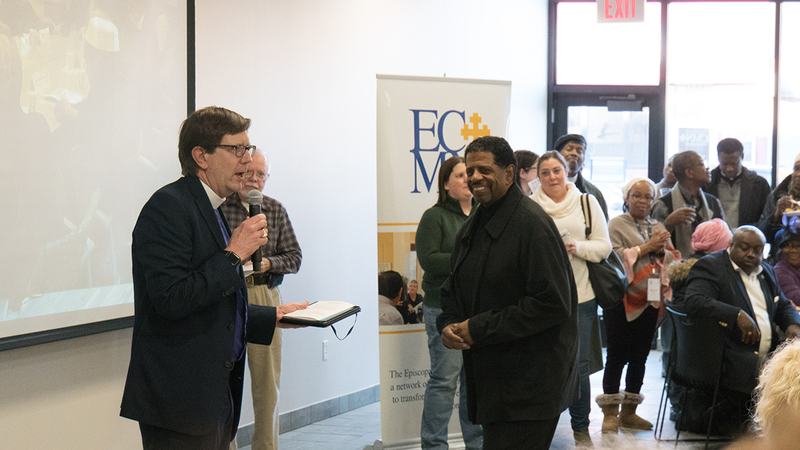 It was a relationship that brought ECMN to its new community on the corner of West Broadway Avenue and Emerson Avenue, in the heart of North Minneapolis. Sammy Mcdowell owns Sammy’s Avenue Eatery, home to what many locals consider the best sandwiches and sweet potato pie in North Minneapolis. Sammy’s had provided food for ECMN events, and through this a relationship began to form. So, when one of the tours of countless office spaces brought the bishop and the trustees to the address of Sammy’s Avenue Eatery and they toured the office space right above the café, they began to sense the call of God to this new space. North Minneapolis has faced its share of challenges over the years. With a lack of investment by businesses, schools and industry, the community has been economically depressed. And yet there are churches and organizations that have been doing good work there for decades. The purchase and construction of the new offices was funded by the sale of the previous office building. The new offices are set over three floors and include four conference rooms, one large meeting space, and many other areas to gather, collaborate and network. There are offices that will be used by community partners, both those with Episcopal roots and others, to act as an incubating space for innovative work that benefits Minnesotans. Meanwhile, Sammy’s Avenue Eatery is co-located in the space, which further deepens and strengthens the existing partnership, as the restaurant continues to act as a hub for North Minneapolis residents and as a place to meet, eat and build relationships with others in the community. – Kelsey Schuster is missioner for communications with the Episcopal Church in Minnesota. This is Good News! It’s an example of “joining God in the neighborhood” – finding what work God is already doing in our towns and neighborhoods and joining in. For those of us who grew up on the Northside in the 40’s and attended either North High or Patrick Henry High School remember this building as the First National Bank. The large space on the second floor was used for dances several times a year. We called thes events “Pat Pola Dances” which brought kids from both northside high schools together. It was a great experence as we got to know each other outside of the sports rivalry between the Patrick Henry Patriots and the North High Polars at that time.